Laurel & Party put so much thought into the stunning design of this elegant Four Seasons Westlake Village wedding reception, beautifully accented by the skillful hand of Peterson Event Lighting. In the foreground is the couple's incredible sweetheart table, covered in a luxurious textured and jeweled linen, gold china and flatware, delicate flowers, satin napkins with intricate napkin rings, and the warm glow of mercury glass candle holders. 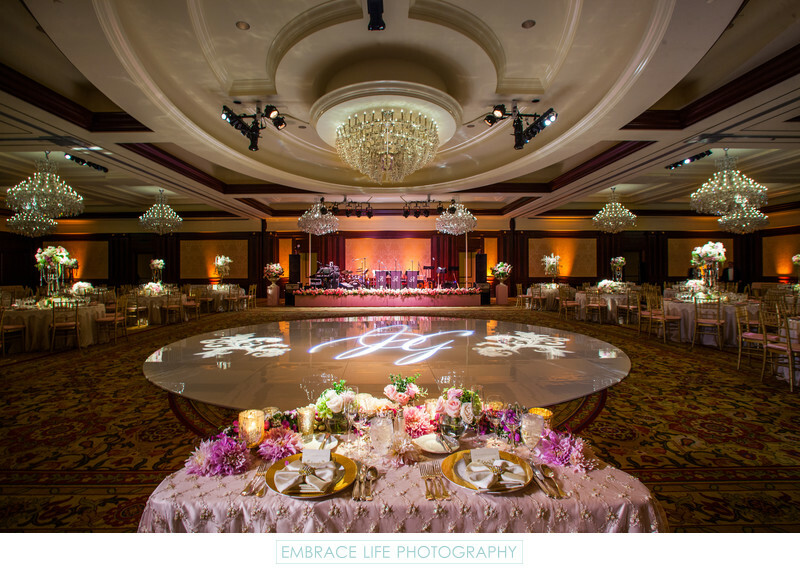 Behind that is the white, round dance floor with projected pattern and monogram lighting, and the flower-lined stage where the wedding band, Rembrandt, would later entertain the wedding guests throughout the reception. The incredible flower arrangements by Brad Austin Imaginative Florals helped bring a bit of the outdoors inside this ballroom wedding reception.